Wicketkeeper Tom Moores has committed his future to Nottinghamshire by signing a new deal that keeps him at Trent Bridge until the end of the 2019 season. 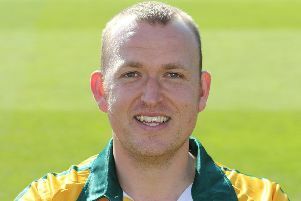 The 21-year-old was ever-present in the Notts Outlaws side that won the NatWest T20 Blast for the first time in the club’s history this summer. Moores took 12 catches and completed one stumping during the competition and scored 191 runs with the bat, including an important 57 in the win at Derbyshire Falcons. “It’s fantastic to commit to the Club. With the year we have had in 2017, getting promoted and winning two white ball trophies, it was an easy decision to make,” he said. Director of cricket Mick Newell has been pleased with the progress of former England Under-19s player Moores and said: “Tom’s had an excellent season, certainly in T20 cricket, and he’s been a major part of our success there.